Jugofresh is a local South Florida hotspot for cold-pressed juices, acaí bowls, and other super-healthy goodies. Last year I picked up some of their Spicy Crack trail mix and the flavors blew my mind – it was chewy, spicy, and tangy. I bought it because it's made with the best superfood on the planet – turmeric; which if you know me at all you know that I'm a little bit obsessed with because of it's cancer-fighting, antioxidant, anti-inflammatory, antiviral, antibacterial and anti-fungal properties. 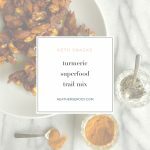 I'm always trying to find ways to get more turmeric into my diet – I mean we ALL should – it's THAT good. So that's why I shelled out $9.50 for a small bag of this Spicy Crack from Jugofresh. I was hooked, but who can afford to snack at those prices? So recreated the recipe at home, but with black pepper because scientific Studies have shown that up to 2000% more of the beneficial polyphenols in turmeric are taken up into the bloodstream if they are present with the active ingredient in black pepper. So, if you eat turmeric without black pepper your body can't really get to all of the good stuff. Turmeric and black pepper really are best friends. Always eat them together. Now that I eat a ketogenic diet, I've tweaked the recipe again to become keto-friendly by taking our the dried fruit adding in more nuts and I replaced the regular sweetener with no carb Swerve sweetener. I get all my dried fruits from Trader Joe's, since they are always fresh and well-priced, with minimal or no sugar added. Just mix everything together and let it sit for an hour or two or until all of that spicy-sweet citrus marinade has been soaked into the nuts & seeds. The result is an addictively spicy, citrusy, and crunchy trail mix of superfoods that tastes like nothing else you've ever tried. 1 TBS organic coconut oil warmed so it's liquified. Line a baking sheet with parchment and pour the mix onto, spreading it out. Bake 10 minutes. Turn mix with a spatula and bake for an additional 5-10 minutes. The mix should be a deep golden brown, but watch that the nuts don't burn. Allow to cool. Taste for seasoning. If you like it a little spicier dust mix with a sprinkling of cayenne pepper & or more turmeric. Mix will firm up into bark in the fridge. Note: turmeric is bright golden yellow and can stain. Wash up right after handling & making. Yes it can still stain after you make the trail mix. To minimize staining, keep the trail mix in the refrigerator and/or eat it with a spoon. If you do get stain on your hands it really helps to wash your hands right away. 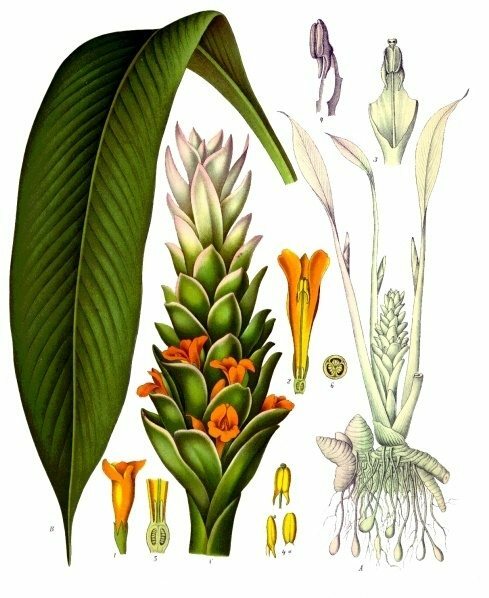 I know it’s a pain to deal with but the healing powers of turmeric are so powerful I think it’s worth the fuss. I understand that turmeric can stain , so after it is baked in the trail mix, does it still stain? Trail mix ordinarily is eaten with hands, and this sounds so good, but the stain can last awhile.